After a long time finally a new version! It's still not completly finished but imo it's stable enough to release the first Beta. Extract the content to any folder and enjoy! Note that the Linux Version is still Beta 1. The next release will add better linux support. Please report every bug/flaw you find so I can fix them for the stable 2.0 release. No huge feature requests please! I found a bug: I opened a single player save game, make an edit, save, shut down WH32edit. Now the save game is unloadable with dark omen (though still openable via wh32edit). I'm using the MinGW version. The font in the older version was nicer. Can you give access to all 6 item slots. Can you add spells and spell books to the item slot please. Could you tell me the exact steps that reproduce this problem? The file extension is always set to .arm. So if you do a save As darkomen.000 it is saved as darkomen.000.arm, looks like the filters need a change (and All Files (*. *) is missing, hm). The window titlebar is also not updated after a Save As operation, another bug. Looks like I have to provide a second view option. The army file has 6 item slots but the game ignores them and only uses the first 3 :/. So this would make no sense. The development of Wh32Edit is still going on and I made great progress. One recently finished feature is translation-support. Help your non-English speaking friends in modding Dark Omen by translating one of your favourite modding tools. Translating the whole program will take around 2-4 hours and the translation tool is foolproof. No programming skills required! Contact me now to get further information and the latest Wh32Edit dev version (to test your translation). I expect interest from the countries Argentina (Spain), Belgium, Denmark, Norway, Poland, Russia and Sweden. why u dont upload it at homepage? Because I wanted to finish some other features first. And it has some critical bugs like e.g. corrupting Savegames. Wh32Edit 2.0 Beta 2 is out! I updated the Download links in the first post. Enjoy . As usual: Report any things you dislike or if the program should behave strange or crashes. Havn't planned another release soon because I dont have much freetime at the moment (and so made no progress with Wh32edit) but I had to fix a huge bug. Thx to Erebus/Nagash for reporting it. nice tool work gaybriel , me and my shadow are happy now . Could be "goblin flag(trading post only)" be a passive, which gives a regiment vision of 360 degrees? I think so because when i got my infantry behind goblin archers (my troop was also behind trees) - they still had vision of them no matter how much i was waiting for "in cover" status. It is a reason why you cant attack them from behind freely (because they dont manually move if you dont fire at them for 2 times and you are able to attack them harmlessly from behind IF they wouldnt see you for 360 degrees). Sorry for my bad language. P.S. this thing (360 degrees vision of 1 mission goblins) was in PSX version of game, so i didnt tried it on PC dark omen. I will try it out on PC, but much later. Interesting idea, I will also test it soon on PC version. If you add too many or remove too many armies from the list (can't say exact values, but let us say that it is better to stick to the default amount of armies, even if you do not use half of them in the campaign), the savegame file is modified and is no longer seen by Darkomen, though it still has valid formation and Editor opens it alright. 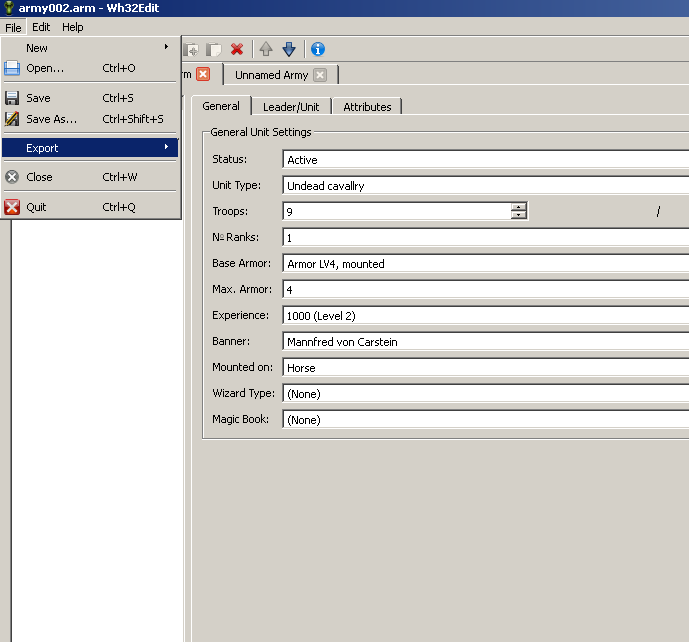 If I started a campaign with too many units, I have to manually delete extra zeros appended to the end each time I edit in WH32, then DO loads the save file alright.